Wausaukee Ice Cream Lovers…Last year some innocent gift shop visitors from Wausaukee, Wisconsin tasted some of our homemade ice cream. That was it…there were ice cream eaters from Wausaukee back at the Bishop Baraga Shrine every weekend of August last year. 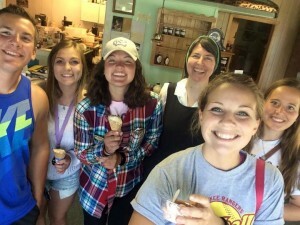 And this year as soon as they hit L’Anse they hit the Bishop Baraga Shrine and ate some more ice cream. They came Thursday, Friday and Saturday this week! I have to get to making more ice cream after their visits. Here is a great photo we made as they enjoyed the ice cream on Friday. What Could Be ‘Better Than Ice Cream’?